Midsummer Cottage01263 715779work01603 870304fax Self-cateringThis quaint cottage sits on a tranquil lane atop a small hill in the Norfolk countryside. With views over the Cley marshes towards Blakeney Point, this property features comfortable furniture, modern utilities and is maintained to a luxurious standard. Guests can relax in its conservatory or take a trip to the beach. 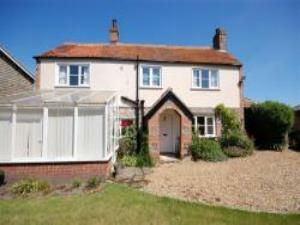 This quaint cottage sits on a tranquil lane atop a small hill in the Norfolk countryside. With views over the Cley marshes towards Blakeney Point, this property features comfortable furniture, modern utilities and is maintained to a luxurious standard. Guests can relax in its conservatory or take a trip to the beach.